I allude to the recent article by R.W.W appearing in the press under the caption ‘Right to vote’. Since the writer apparently finds the Proportionate Representation (PR) voting system as the main culprit for the existing political culture in our country, I wish to discuss the rationale for the PR system as opposed to the Westminster or the ‘First-past-the-post’ system. 1) Electing representatives to the National Parliament or the Legislature through voter franchise, demands a system that is universally and constitutionally ‘fair and equitable’. 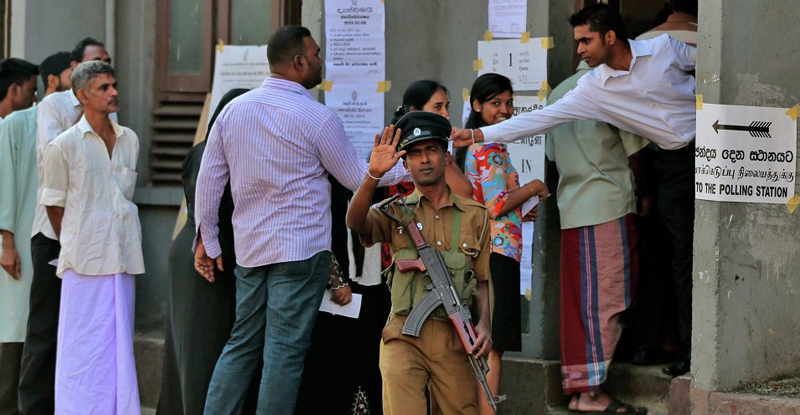 For this purpose, it is critical that every valid vote cast by a Sri Lankan at a National election is given an equal value, whether it is cast in the South, North, East or the West. Being the National level election, ideally, the entire country should be voting as one electorate in order to elect representatives proportionately from the contesting parties to the National Parliament. The voter decisions should be mainly based on a legally enforceable Election Manifesto put forward by the respective contesting parties to develop and manage the country as a whole for a given period of five years. If an elected Govt. willfully backtracks on its performance or reneges on its promises, the voters should be able to resort to legal action as mentioned in my recommendations given below. 2) Under the ‘First- past- the post’ or the Westminster system which functioned before the advent of the decentralized Provincial Councils in 1987, the MPs being the main political contact were elected by the people voting from small, unequally populated electorates which distorted the equal value of the vote and the overall aspirations of the nation. The 1970 and 1977 election results which glaringly exposed the shortcomings of that system, paved the way for a much better and a fairer Proportionate Representation (PR) system. However, it is unfortunate that its objective was later subverted by annexing the politically expedient ‘Preference Voting’ (PV) method. This method opened an opportunity for MPs to ‘cross –over’ aided by a court decision, which led to a mockery of the voter franchise and made the tedious election process itself an exercise in futility! It must be borne in mind that through the ‘District Party Merit list’ mechanism, the original PR system envisaged to prevent any on-course changes in the balance of power through so called ‘back stabbing’ by MPs who decide to betray their voters mainly for personal reasons and kick-backs than forging national imperatives. The ‘District Merit List’ paved the way to dispense with high cost bi-elections. In this era of advanced communication, freedom of the press and right to information, robust ‘Opinion polls’ can be used to test the Popularity/Unpopularity of a Govt. 3) The much larger District electoral unit under the PR system discourages the much maligned ‘MP chit’ system and allows the MPs to discharge their ‘Law maker’ duty more effectively. 4) In hindsight, no voting system can be perfect, for in the first place, voting is not mandatory resulting in a large percentage of unpolled votes and in the second place, the decision of the voters spanning an age limit of 18 to 80 cannot be construed as logical and intelligent all the time! Thus, it is very much evident in Sri Lanka as well as in other countries that if the non-voting and the rejected votes are reckoned, the final result can be diametrically reversed. In other words, the outcome can be different from the desired verdict of the people! The PR system attempted to make it as ‘fair and equitable’ as possible by having additional mechanisms such as Bonus seats and National list system. Thus, it is clear that only a PR system can justify the concept of ‘equal value’ for every vote while sustaining Sri Lankan identity. It also mitigates the existing ‘Confrontational’ attitude amongst voters and politicians. 5) In my view, it is after putting a ‘fair and equitable’ voting system in place, that we should discuss the structure or the type of governance that we desire. Having understood the fairness and the advantages of the most democratic PR voting system, we should also recognise the unavoidable repercussions from the advent of a three tiered Decentralized Political Administration system in 1987 comprising National Parliament, Provincial Councils, and Local Govt. (Municipalities, Urban Councils and Pradeshiya Sabhas) that have come to stay, not forgetting the tier of all-powerful Executive Presidency! 6) Considering the foregoing, I recommend the following steps in order to form a ‘Peoples Govt.’ as this is the ideal time for such a transition or a paradigm shift and it should not be missed. a) Abolish Preference voting system at Parliamentary and Provincial Council (PC) elections. b) Re-introduce the ‘Party list’ system which was an integral part of the original PR system, to Parliamentary and PC elections. c) All civil rights activists/ organisations including the ‘Paffrel’, CMEV and ‘Caffe’ should pressurise the political parties with full backing from the mass-media to select and nominate educated, honourable, decent political professionals with high integrity, acceptable to the society to contest at the General elections. Towards this end, the Elections Commission shall lay down a robust set of eligibility criteria for Election candidates. Returning to the ‘All Party March 12 declaration-2015’ can be a good starting point. The next phase should begin after the publication of the respective Party nomination lists in the press. The voters have to be educated on the need to cast their vote to the party which fields candidates who best qualify to enter the Parliament. In this regard, the media can play a dominant role by publishing the profiles of all candidates on a District wise basis. d) Seal all types of loopholes that enable ‘Cross-overs’ which kill the spirit of the PR system. The sovereignty and the collective –conscience of the voter Principals are subverted by this unethical phenomenon which seeks to justify the conscience of paid representatives of the people. e) Constitutional provision to be made for all contesting parties to legally register their Election Manifestos on the nomination date in order that they can be contested in courts for non-implementation. This is a sine-qua-non as the voter decision has to be guided mainly by the Party policies enshrined in their respective manifestos. f) Constitutional provision to be made for an ‘All Party’ Cabinet of 30 parliamentary members to be formed by applying the same PR arithmetic now being used to select National list MPs. The Executive President should hold only the Portfolio of National Security and Defence. He would appoint the other Ministers consensually. By this method, the PR system brings about a permanent ‘WIN-WIN’ situation where all citizens including the politicians would forget their party rivalries after the elections and forge ahead as one truly Democratic Nation under a ‘Peoples’ Govt.’ Since our broad economic, social, cultural and foreign policies are now very much in place, we would at most be electing the party who in our opinion can more effectively steer the country forward, through an ‘all-party’ Cabinet of Ministers. The inclusion of TNA in the cabinet will help to remove the perpetual suspicion they harbour about a so-called ‘Sinhala Govt.’ The entire election process would then turn out to be a routine, five yearly, peaceful exercise, sans fan-fare and extravaganza which an emerging country like ours can ill afford. g) As the decentralized administration has come to stay with the long existing Provincial Councils flowing down to the Local Govt. machinery, strengthen them to derive maximum returns from that huge investment thereby leaving the Parliamentarians at the centre to play their exclusive role of Law and Policy making and controlling the country’s finances. h) Amend or remove all the obnoxious provisions, governing the present Executive Presidency to ensure independence of Parliament. i) After his /her election by the people, the Executive President should be neutral and act as a ‘Statesman’ looking after the entire citizenry of the country and therefore should not be allowed to promote any political party. Ideally, if the concept of running the Executive Presidency, Legislature and the Judiciary as three independent institutions is to be implemented in its true spirit, the Presidential elections should be contested by non-political, independent candidates qualifying under a specific set of criteria. j) Fix the time period including the month for holding future Presidential and Parliamentary elections. A cost reduction can also be achieved by having both Presidential and Parliamentary elections on the same day. We as peace-seeking, civic minded, decent citizens yearn to see an end to this distorted system of confrontational politics by replacing it with a system of consensual politics; a system that breeds no political rivalry; a system that is fair and equitable and also a system that is cost effective and productive enough to deliver a peaceful and a prosperous Sri Lanka. In this regard it must be stated that the civil society should form the nucleus of any effort to formulate a system of Governance that best suits our country. Politicians as representatives of the sovereign people should only give the formal authority for implementation of such proposals in keeping with the constitution. We hope that sanity would prevail and the Govt. would capture this golden opportunity of making ‘Consensual Politics’ a reality by implementing the aforesaid recommendations at the next Presidential /Parliamentary elections.